"Stayed here last week for a group ski trip. The chalet was perfect. Great location, close to the Super Morzine and the supermarket/town. We couldn't have asked for more from the chalet, it have everything we needed, nice and spacious and good communal space. Very clean and tidy and clearly recently refurbed. We booked with Mountain Highs who were fantastic from start to finish!" 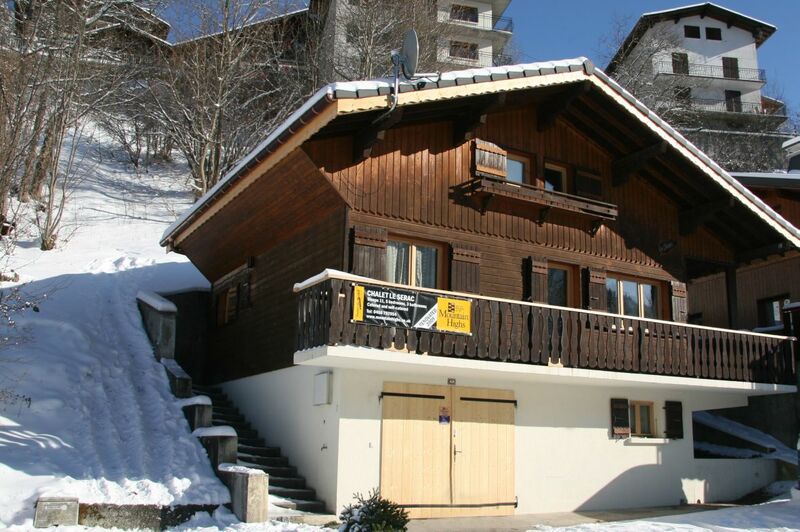 Chalet Serac is situated very close to the town centre but in a quiet spot close to the River Dranse and the Palais des Sports. The latter has a gym, sauna and jacuzzi. Two minutes' walk from the chalet across the river brings you to the free public elevator to the Super-Morzine telecabine station. From there it is five minutes walk to the Pleney lifts (or a quick ride on the free "petit train") where most beginners would be having their lessons. Just 2 minutes' walk in the other direction you have the lively Rue du Bourg, where many of the best après ski bars are found, and the main Carrefour supermarket. Serac is ideal for small groups or family skiing trips as there are five bedrooms and three bathrooms (one is ensuite). 2 bathrooms have baths and 1 has a shower. There are 4 WC's. The stylish open-plan living / dining and kitchen area is delightful and has three comfortable sofas and flatscreen TV with Freeview channels & DVD. There is high-speed Wi-Fi throughout the chalet. The chalet is really well equipped for groups self-catering. There is a dishwasher, washing machine, tumble dryer, drying cupboard for ski gear / mountain bike gear, wide 5-hob, 2 full-size ovens, fridge/freezer and bar fridge, and all the kitchen equipment you could need. Both double bedrooms have flatscreen TVs with Freeview channels and the triple bedroom has a TV with DVD / video player. There is a secure garage at ground level with ample space for mountain bike storage and tinkering, and a hose for washing down bikes and riders! There is underfloor heating on the ground and middle floor, and wall-mounted radiators on the top floor (rarely needed...). 2 huge water tanks provide ample hot water. In summer, the location of the chalet is ideal: apart from its central Morzine position, the tennis courts are just opposite, the Olympic-sized swimming pool complex is 100m down the road, and the Super Morzine lift (which runs in the summer) 150m away, offer mountain bikers easy access to some of the best downhill and cross-country terrain in the Alps. The wide sunny balcony which runs round the front and side of the chalet is ideal for sunbathing and evening BBQ's. There is parking right outside for 3 – 4 cars. We are part of the superb Multipass offer, which means that our guests are able to use some leisure facilities in the whole of the Portes du Soleil for just €2 per person per day. Serac operates on a Saturday changeover and has a minimum 1-week stay in winter and summer; in low season we are able to be more flexible.